Chris Wraights portrayal of them in Wrath of Iron is by far the best and so far only good interpretation. They do not only scream "Flesh is weak!" and hurr durr, but they also on a small atomic level act in every way machine-like. And they do things not just because they are stupid, but on a logical way it is the best alternative. I also liked the small tidbits of Ferrus Manus who were worried that his Legion was flawed as they craved to better themselves (not unlike the Emperor's Children) through machines. The only fault in that is they are already perfect in every stance as possibly could be. Imagine if Feat of Iron, being no stupid tale of rash Ferrus "I'm a hot head and hence forth stupid" Manus who is hunting aliens only to see the most obvious "You will be decapitated! "-prophecy, would build upon this. It could be prior to Isstvan V when Manus scribes his worries about the future of his Legion, how he and some senior officers would clash because he doesn't support their decisions to actively cut of their limbs, how he hate his own arms for what they are despite what they can do. And the ending would allude to them becoming fanatics rather than retelling the obvious ending of Fulgrim. In that way it would serve a purpose pre-Isstvan with tellings of the future. It would also show that they aren't now a days the most stupid Legion ever conceived. That would add character, it would add conflicts and we would see them in a new light other than stereotypical re-takes of the overexagerated Codex. Warhammer Community just posted this hilariously funny Regimental Standard today. 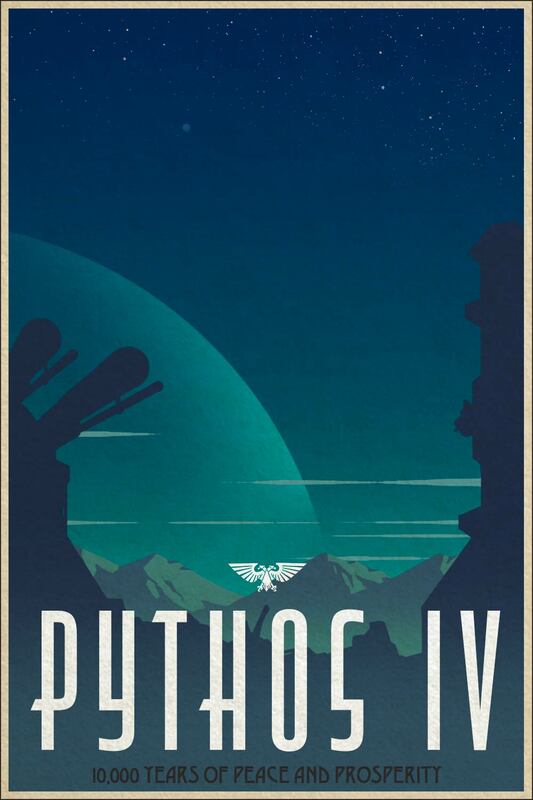 Best of all, the fortifications on Pythos are built to the same STC specifications as all others in the Imperium, meaning that it’ll feel just like home when you’re indoors – right down to the reassuring thrum of the plasma generators, the comforting mumbling of the attendant-servitors and the scratching of servo skulls noting your every move, so neither you nor your superiors are in any doubt about where you were at any given moment. In order to ease your transition, we recommend you consult Uplifting Pamphlet 5147//c: Why Is The Roof In This Hive City Blue And Covered in Fluffy White Cave Fungus And 312 Other Questions Frequently Asked By Urban Recruits Deployed To Undeveloped Worlds. Unusually for a world whose name appears very frequently in Imperial records, Pythos IV has an almost unbroken record of peace, broken up only by some sections where data is missing during the 31st and 41st Millennia. We’re sure that this is simply because any archivists of the time were bored by their bucolic, jungle-living lifestyle and wanted to sign up to fight against the forces of the Archenemy. Pythos is the home of great Imperial heroes! Pythos is home to Colonel “Death” Strike, a renowned hero of the Catachan Jungle Fighters. Worry not, Guardsmen! It’s only a name. The Colonel possesses only 88% of the average combat efficacy of a Deathstrike Missile, an inaccuracy that Imperial High Command has graciously agreed to allow given the Colonel’s personal commendations by the Dark Angels Chapter. * Note that is has been deemed casualty-efficient for guardsmen on Pythos to hunt their food for themselves while supply-lines are repaired following an unrelated incident. Rest assured that if nutrient-menials were permitted to feel gratitude for anyone other than their direct overseer and the Emperor then they would thank you. ** A note to Whiteshields: “Leave” is a period away from service permitted to higher-ranking officers in order to give them time to rest their highly attenuated strategic sensibilities. I read this thread again for the first time since 2014. It?s unbelievable that Annandale is still getting away with his awful writing. Terrible then, terrible today and I?m sure terrible tomorrow. BL have got such a great stable of writers they don?t need this crap. What?s worse is he has been given quite a few limited editions and key novels to write.